White paper on crime 2001 Part3/Chap.2/Sec.2/3. 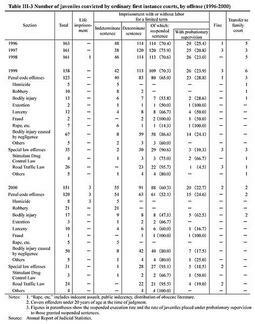 Table III-3 shows the types of punishment for juveniles convicted by ordinary first instance courts in the five-year period from 1996 through 2000. The Table breaks down the data for 1999 and 2000 by offense. By offense, bodily injury caused by negligence had the greatest share in the number of juvenile convicts both in 1999 and 2000 (42.4% in 1999, and 33.1% in 2000), followed by Road Traffic Law violations (16.5% in 1999 and 15.9% in 2000), bodily injury (8.2%) and larceny (7.6%) in1999, and robbery (13.9%) and bodily injury (11.3%) in 2000.